4D Acres is an emu ranch in Louisburg, KS, owned and operated by Mike and Dee Martin. In the late 1980s commercial emu ranching got started for purposes of selling meat and oil. The oil has become particularly valuable after stories of aborigines in Australia having used it as a general purpose ointment. Today, 4D Acres primary product is emu oil. The jerky that 4D Acres sells are all chopped & formed, with 3% beef. I'm not certain the reasons for adding 3% beef, other than it could be due to USDA inspection requirements for exotic meats. 4D Acres offers this "with Raisins" as well as "with Cranberries", which I'll review later. They also offer a spicy version with Jalapenos. Their jerky appears to have been manufactured by Luther's Jerky, of Le Roy, KS. Emu, raisins, 3% beef, salt, spices, garlic powder. The first thing I taste from the surface of these pieces is a light smoky flavor, and a faint saltiness. After some sucking, I can pick up a faint flavor of those raisins. Overall, a very light surface flavor. The chewing starts with some natural meat flavors, just a tad more saltiness, and a little bit of spiciness. There's a faint bit of tanginess to this, perhaps from the raisins. For being advertised as "with Raisins", it doesn't really have a strong flavor of raisins, and nor do I see bits or chunks of raisins. However, I do seem to sense its presence. I can taste something in there that resembles raisins, it's just not a well defined flavor, it's more like tasting the influence that raisins have on this jerky, as opposed to tasting the raisins themselves. The natural meat flavors are there, but seem to be at a light flavor intensity. Even though light, it's still easily noticed because the other flavor components are light as well. It's more like a cooked flavor. Since I can't remember the last time I've eaten emu, I can't tell you if it tastes like emu. But there certainly is a meaty flavor to this. There's a bit of spiciness to this, but not anything hot. It's quite mild. But I can certainly feel a little spicy bite in the back of my tongue. The garlic is barely noticeable, mostly as an aftertaste. The saltiness is at a low intensity. Overall, what you're going to taste is the natural meat flavors at a light amount, having something more like a cooked flavor. You'll taste the influence of raisins, not necessarily the actual flavor of raisins. Throw a little bit of saltiness and spices, and it's largely a light tasting jerky. 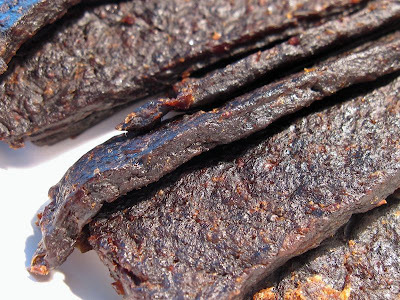 This a chopped & formed jerky, pressed into strips about 3/4 inch wide, and about 6-8 inches long. 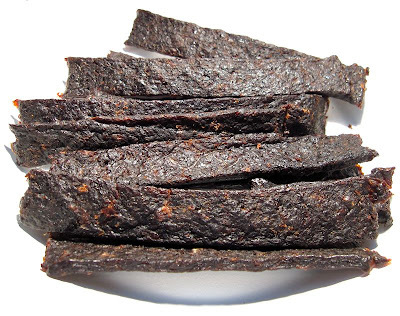 It's a dry jerky that breaks apart quite easily with just a little bit of bending. Chewing seems quite easy. The chewing texture starts off feeling stiff, with just a tad bit of rubbery resistance. But with just a few chews, it falls apart into a crumbly mass. It never chews like real meat, but just crumbly, perhaps comparable to dry meat loaf. For the most part, these strips seem to be mostly all meat. I don't really encounter any hard bits or bone or cartilage. I do feel some tiny little crunchy pieces, which I believe to be seeds from the raisins. And unlike most other chopped & formed jerkies, this is not oily at all, but dry. For that matter, it's pretty clean eating. No residue on my fingers, and no tiny fragments flying off as I bite pieces off. 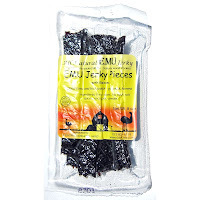 4D Acres sells this Emu Jerky with Raisins from their website at a price of $10.00 for an 8oz package. I bought two packages, this one plus the other with Cranberries. Add to that shipping costs of $3.85, and it brings a total of $23.85. That works out to a per ounce price of $1.49. For general jerky snacking purposes, at the $1.49 price per ounce, this jerky offers a weak value. I'm not getting much snackability at all from this, due to a weak flavor, and a poor chewing texture, and I'm just not sold on raisins as a jerky ingredient. Even though the $1.49 price per ounce is slightly lower than what you'd pay for mass-market brands at the store, I just don't get any value from this. But as an Emu jerky with raisins, at the same $1.49 price per ounce, I'd say it's a decent value. I do get some natural meat flavors, albeit a cooked flavor, and I do taste the influence of raisins, not necessarily the actual flavor of raisins. But it's still a light tasting jerky, and I'm left wanting more flavor. I had really hoped to get something new and unusual considering it's emu meat, and that it contains raisins. But instead the overall flavor is light, and I don't see much to enjoy in this. The addition of raisins (ground raisins apparently), adds a unique flavor to this, but one that I don't feel pairs well with meat. In some respects, it's almost like taking a box of raisin bran, grinding it all up, and pressing it into bars. It's best attribute is that it's easy to eat, even though it's dry. And unlike a lot of chopped & formed jerky, this stuff is not oily and leaves your fingers clean and dry. But the chewing texture is awful, feeling totally crumbly. For a moment I was on the line between rating this as "fair" or "dog treats". I thought it was still tolerable, but after eating several pieces I found myself not being able to eat anymore. So I opted for the lower rating.